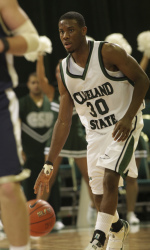 Cleveland State's Norris Cole is quickly becoming the front-runner to win the Horizon League's Player of the Year Award. Cole's numbers speak for themselves. He leads the Horizon League in scoring (20.2), assists (5.0) and steals (2.4), and is eighth in rebounding (5.5). One thing that should help his case is that CSU is sitting all alone on top of the Horizon League standings after the Vikings defeated Illinois-Chicago, 63-49, on Thursday at the UIC Pavilion. CSU (19-3, 8-2 Horizon League) are a half-game ahead of Valparaiso (15-6, 7-2), a game ahead of Wright State (14-8, 7-3), and are 1 1/2 games ahead of Butler (14-7, 6-3). Seven of the past eight Player of the Year winners have come from the team with the best record. The only exception was Butler's Brandon Polk during the 2005-06 season. The senior from Dayton had another Player of the Year type of a game against UIC, finishing with a game-high 22 points. It was his 11th game this season that he has scored 20 points or more, which leads the league. The next closet players with the most 20 point performances this season are Green Bay's Rahmon Fletcher, Butler's Matt Howard and UIC's Robo Kreps, with six each. With UIC holding a slight 14-12 lead, Cole picked up his second foul with 9:57 remaining in the half and sat on the bench. The Flames then went on a 7-0 run to take a 21-12 lead. CSU coach Gary Waters was forced to put his star back into the game and Cole responded by scoring six straight points to get CSU within 23-21 with 3:50 to go. In the second half, it was Cole's steal and lay-up that gave CSU the lead at 41-39 with 14:08 remaining. It was their first lead since 3-2. The Vikings would not relinquish the lead. Cole would score nine points the rest of the game to help CSU preserve the victory. "Obviously, Norris is the best player in the league so he's going to take the game over," Waters said after the game. "What I don't think a lot people realize is what makes him the best player in the league? He takes a player and shuts him down. He does it every single game." Against UIC, Cole shut down the Flames' leading scorer, Kreps, who came into the game averaging 15.3 points per game, and limited him to 10 points on 4-for-10 from the field. "It's my job to stay solid on him and limit his touches," Cole said after the game. "That's my role for this team on defense is to take the other team's best perimeter threat and shut him down. That's what I did tonight." Earlier this week Cole was named the Horizon League's Player of the Week for the third time this season, which also leads the league. In CSU's two wins last week against Detroit and Wright State, Cole averaged 16.0 points, 7.0 rebounds, 8.5 assists and 2.5 steals per game. In CSU's win against Detroit, Cole became the first player in the Horizon League this season to tally a point-assist double-double (18 points and 11 assists). He followed that up by flirting with a triple-double against Wright State, finishing with 14 points, 10 rebounds and six assists. The only CSU player ever to be named Player of the Year was Ken "Mouse" McFadden back in 1988 in the old AMCU, which became the Mid-Continent Conference and is now known as the Summit League. When Cole was asked earlier in the week in an interview with the Horizon League Network. Is there anyone in the league that is playing better the you? Cole responded, "I don't really know. I know Matt Howard has been playing very good the past couple of weeks. Brandon Wood has been having a consistent season," he said. "I take pride in wanting to be the best in the league. That's what I train for. I want to be respected as the best, but there are a lot of other players out there that are pretty good." Next up: Both of CSU's basketball programs are in action on Saturday. The CSU men are at Loyola-Chicago (13-8, 4-6) at 4 p.m. and the CSU women (11-8, 4-4) are at Youngstown State (3-16, 1-7) at 1:05 p.m.
HL on STO: Saturday's Horizon League Game of the Week on SportsTime Ohio features Butler at Valpo at 2 p.m.